OCEANSIDE VILLAGE - FULL OCEAN VIEW! Book your family vacation now! Our cozy beach cottage provides an awesome totally unobstructed ocean view. The BEACH is DIRECTLY ACROSS THE STREET!! From mid-May through the end of September, Beach Services, Ltd provides two commercial umbrellas and four comfortable beach chairs, set up for you seven days a week with close proximity to Conch Café. What a great amenity--a true convenience during peak season!! MOON SHADOW is located in Oceanside Village, a private gated family-friendly community which provides well-maintained amenities. The tasteful beach decor sets off an immaculately clean home, ensuring an enjoyable vacation stay . It is located at 1914 Lark, 70 yards from the beach, and is like no other rental in Oceanside Village. Our location allows for a beautiful ocean view from our covered front porch with bar height table and chairs, so no matter what the weather brings, you can still relax and enjoy your stay. 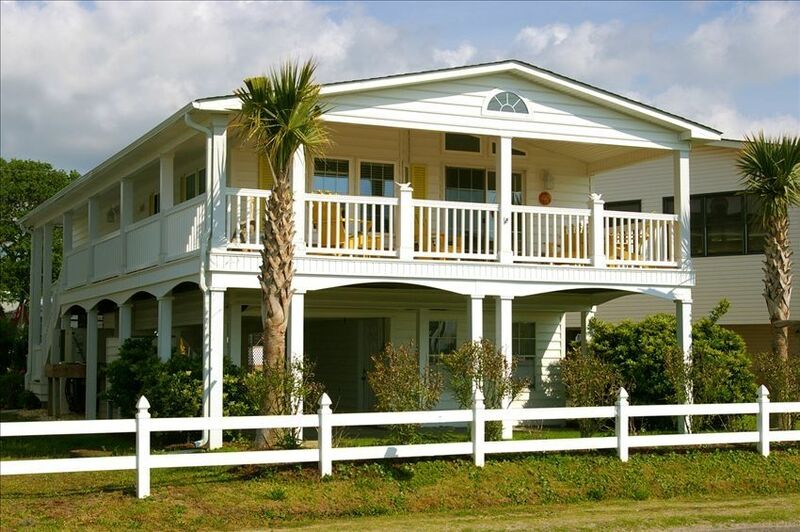 Close your eyes, smell the salt air, feel the sand in your toes, and hear this home calling your name! This cozy home has two bedrooms, two full baths, sleeps eight with one queen bed, two twin beds, two queen sofa sleepers, all with comfortable mattresses and pillows. A linen rental service provides sheets and bath/kitchen towels delivered for you. Hard surface flooring throughout makes for an allergy-free setting. Front-load high-efficiency washer, dryer, new appliances: refrigerator, microwave, ultra-quiet Bosch dishwasher, garbage disposal, three flat screen TV's with digital cable service and secure Wi-Fi Internet, concrete driveway, outside shower with hot/cold water, ceiling fans throughout, carport, bar-height outdoor furniture set on our covered porch, upper deck with full ocean view, ground level concrete patio with gas grill, picnic table and additional seating for outdoor barbecues. Living Room has a Smart TV with Internet access and Netflix account for guests; master bedroom and second bedroom both have Blu-ray, Wi-Fi enabled DVD players for internet streaming. Your amenities include private gated ocean-front parking for your vehicle and a rented golf cart. OSV amenities include an indoor (heated) pool open year round; a outdoor pool, children's water park; and hot tub area (open seasonally); lighted tennis courts, baseball/softball field, basketball court, a community center, lakes stocked for fishing, biking, strolling on the beach, and much more. Go to for more information on Village amenities. Our calendar is updated daily, but feel free to inquire. A signed Rental Agreement and a 50% deposit (full payment if within 90 days of stay) will confirm your reservation. Small non-shedding dogs under 20 pounds and at least one year of age will be considered. Oceanside Village offers golf cart rentals, either daily or weekly. Rest assured that your stay at MOON SHADOW is be one to remember! We have been personally managing our beach cottage rental since 2011, and have shared our home with many wonderful guests. Both of us are retired, after which we started a lawn care service in our hometown of St. Joseph, MO. Mike's mother was from the Grenville, SC area, thus our ties to Myrtle Beach. All his family LOVES the beach!! He grew up visiting his mother's hometown every summer for two weeks, and still cherishes those memories. Mike's brother and his wife live in the Village and are always ready to help us out if need be. Our guests can rest assured that we devote great care to providing each of our guests with a memorable vacation experience, one that will be remembered for years to come! Our home provide a completely unobstructed view of the ocean! During the summer months, from May to the end of September, you will enjoy commercial beach equipment set up for you seven days per week! What a great amenity!! Beautiful ocean view, relaxing front porch to relax no matter what the weather brings during your stay. Bar height seating allows for full unobstructed view. CLEAN, CLEAN, CLEAN! Linen service makes for worry-free departure. Many free amenities within Oceanside Village's family-friendly community. Blankets, and pillows are provided by homeowner. Linens and kitchen/bath towels are provided by a linen rental service, delivered and picked up directly to the house. Kitchen and bath towels are provided by a linen rental service, delivered and picked up directly to the house. An assortment of books are available for guest use. An assortment of DVD's are available for guest use. Heated indoor pool open year round. Outdoor pool, children's water park, and hot tub area are open seasonally. Hours of availability: 10 a.m. - 10 p.m.
OSV provides a large outdoor hot tub area, open seasonally. Completely designer furnished with all of the luxuries of home! From Memorial Day Weekend to Labor Day, Beach Services Ltd provided two commercial beach umbrellas and four commercial beach chairs set up daily for our guests. Surfside Beach is wonderful. Great beaches, great restaurants, and so close to everything. We have rented this house for 3 years, and every year is better then the last. House is pretty and it has everything. And the best vie2 of th3 ocean. We have stayed in other houses nearby and had great time but this house and community was not a great experience. We love love love staying in this beautiful home on the beach! The Prussman’s know how to make you feel welcome and at “home!” This is the only place we consider when heading to the beach! Have already booked next year! Thank you Mike and Loretta! The decor is beautiful. The location can't be beat. It is,equipped with everything that you need. This is our 4th time staying love the place so very clean and the location just across the street is the beach lovely porch to eat and watch the waves. Fantastic people to work with can't say enough about Loretta. The beach decor is beautiful and so very light and airy inside.We are already planning on coming back next year. Their house seems like home to us always hate to leave .They keep it so very well maintained. We had a delightful time at Moonshadow. The view was great, the porch is outstanding and overall attention to detail is tops! The addition of the 2 beach chairs and umbrellas set up for us every day at the beach was great! Moonshadow is just a short walk to the beach and the Conch Cafe and having less equipment to tote is an added bonus! I also felt the professionally "installed" umbrellas were much safer as many umbrellas were turning inside out and being tossed by the wind. Loretta and Mike have kept Moonshadow in top condition. The decor is delightful and the beds and seating areas are all very comfortable. We have stayed in the Surfside/Garden City area for over 35 years and this was the best spot! A breath of fresh beach air! Staying at Moon Shadow was such a treat! The owners were wonderful to work with and made sure that our stay was amazing! The view from the porch is breath taking and we spent the majority of our time on this porch when not at the beach or the pool, our dog loved sun bathing on the bench too. The house was clean and comfortable and well kept! Our son enjoyed swimming in the huge bathtub in the master bath when not swimming in the ocean or the pool! The colors inside the house and the decor are just beautiful. We truly enjoyed our stay here at the Moon Shadow and highly recommend anyone looking to get away, to come here! Perfect place for a family of three, a dog, and a mamaw, of course! We look forward to going back! I realized I forgot to mention the lifeguard! He was amazing! He greeted us every morning when we got down to the beach. He asked if he could helped with putting up our umbrella or putting it down. He would tell us about the water conditions, rip tides, jellyfish, etc. Was a stand-up guy with a HUGE responsibility. There was one day that the jellyfish were stinging quite a few people and he started going group to group on the beach letting them know why he had put up the purple "Aquatic Danger" sign. For families, I think this is important piece. He is just another plus on why we loved our trip so much! Only 80 yards to the beach! Single family home is on piers, with steps to the living area of the home. Off-street parking for three vehicles, with two under carport. Minutes away from ALL Myrtle Beach attractions, including numerous fabulous golf courses.